This white leather purse has genuine snakeskin in peachy pink, seafoam green, and bone on the front side. It has a top center zipper section and a black fabric lining with an interior zipper pocket. 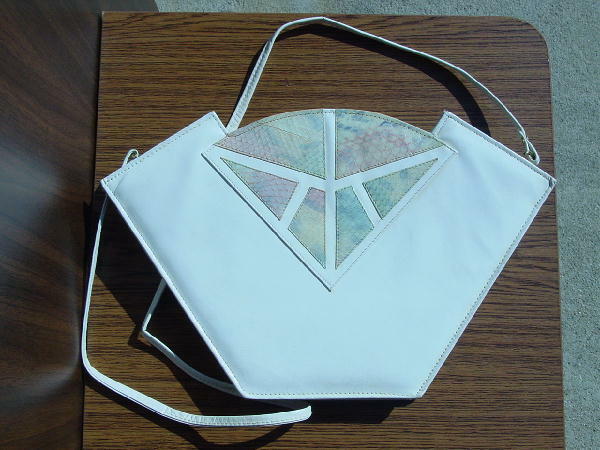 It was made in Hong Kong and has a detachable 41" leather shoulder strap so you can carry it as a clutch. It has a very interesting shape. It belonged to a French model who wore it for 2 seasons in Europe.